DeveloperAuction has built what they call the “first transparent marketplace for recruitment,” allowing engineers to put their talent up for auction from startups that need talent. In the company’s first auction, which ended August 31st, 88 engineers put themselves up for auction and 142 startups, including Quora and Dropbox, submitted over $30m in job offers. Engineers have no obligation to accept the highest offer, but startups are required to honor their highest bid if follow up, in-person interviews are successful and they want to make a hire. The auctions run on two week cycles for the entire site. The company says the next one will go live in mid-September and run until the end of the month. 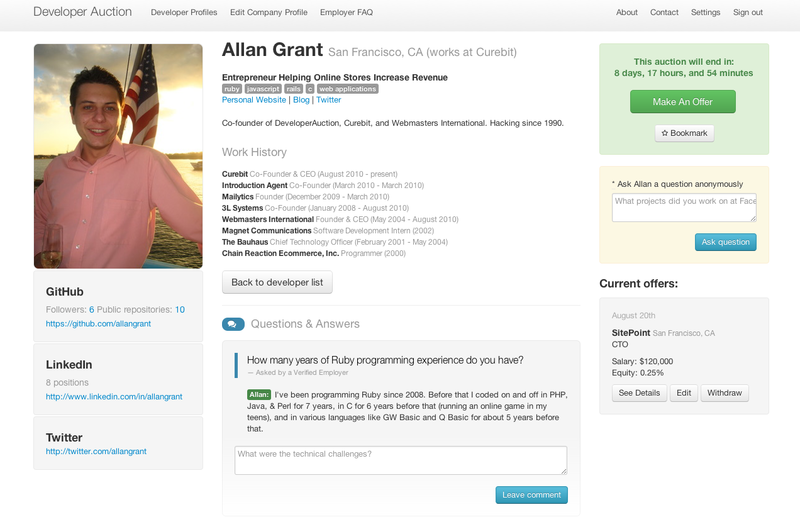 DeveloperAuction says it is accepting applications from developers with “notable GitHub profiles,” CS degrees from Stanford or MIT or currently employed at Google, Zynga, Facebook, Twitter, Apple, Yelp and Square for upcoming auctions. The company was founded by Matt Mickiewicz, co-founder of 99designs, Allan Grant of CureBit and Doug Feirstein, founder of LiveOps and uSell. Mickiewicz says there have been “zero issues” with employers seeing their own employees on the site. The company manually verifies employers via AngelList and only lets approved startups, defined as having raised capital or being profitable, browse engineer profiles. He adds that the company can add filters so employers won’t be able to see their own employees, but notes that it “hasn’t been an issue so far,” due to the selectivity of the platform. Mickiewicz tells me the company, which currently only covers the Bay Area and Boston, is excited about branching out to other cities, specifically noting interest from start ups in New York and Denver. Update: An earlier verison of this post said that Airbnb has made offers on DeveloperAuction. While Airbnb has registered as an employer on DeveloperAuction, Mickiewicz tells me they did not participate in the first auction.